Police and rescue personnel stand at the scene where the helicopter transporting Martha Erika Alonso, governor of the state of Puebla, and his husband Senator Rafel Moreno Valle crashed, in Coronango, Puebla Mexico. A Mexican governor and her senator husband were killed on Monday in a helicopter crash near the city of Puebla in central Mexico, the government said, just days after she had taken office following a bitterly contested election. Martha Erika Alonso, a senior opposition figure and governor of the state of Puebla, died with Rafael Moreno, a senator and former Puebla governor, when their Agusta helicopter came down on Monday afternoon shortly after take-off, the government said. 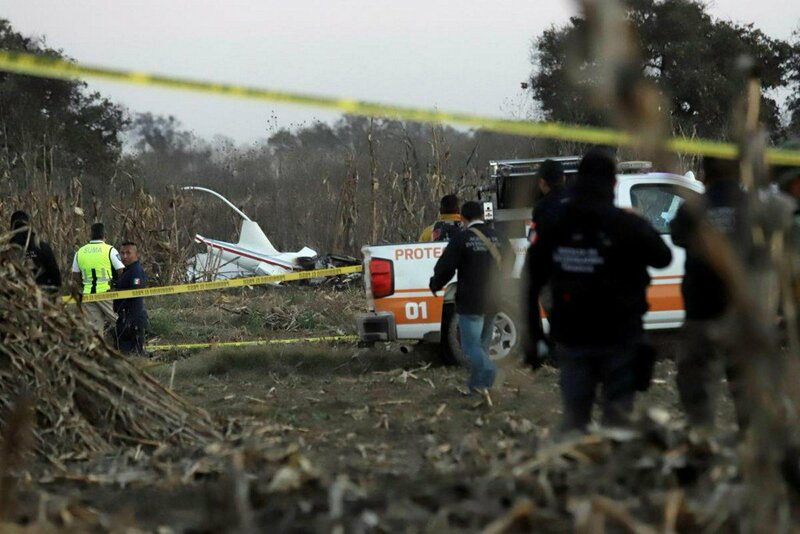 Security Minister Alfonso Durazo said the privately owned helicopter was bound for Mexico City and crashed after suffering an unspecified failure in the town of Santa Maria Coronango, about three nautical miles from Puebla airport. “At this point, there’s no evidence that could lead us to conclude that the cause was not related to how the (helicopter) was functioning,” Durazo told a news conference. Alongside the politicians were Captain Roberto Cope and first officer Marco Antonio Tavera, and it is presumed there was a fifth passenger, Durazo said, without giving more details. President Andres Manuel Lopez Obrador said on Twitter that his government would investigate the accident. Durazo said that the authorities had been in touch with the helicopter and engine manufacturers, who will be at the scene on Tuesday. Television images showed the remains of an aircraft in flames, a plume of smoke and people inspecting the scene. Alonso, from the center-right National Action Party (PAN), took office this month after winning a bad-tempered contest in July. Lopez Obrador’s leftist National Regeneration Movement (MORENA) accused her of stealing the election. Moreno was governor of Puebla between 2011 and 2017 and headed the PAN in the Senate. An electoral tribunal validated the Puebla result only this month, and opposition politicians called for an independent investigation into the crash due to the charged atmosphere. Vicente Fox, a former Mexican president and longtime critic of Lopez Obrador, told local television he was troubled by the timing of the accident after the electoral dispute. MORENA and its allies hold a majority in the state congress. For now, Puebla’s interior minister Jesus Rodriguez will be interim governor before elections are held within five months, the Puebla government said. A number of Mexican politicians have died in aircraft accidents in recent years, including federal interior ministers in 2008 and 2011. The latter two were also members of the PAN.